So understand that this is a survey… and who knows how honest the people were in the survey. Let’s assume with over 6,000 people responding, it’s fairly accurate. 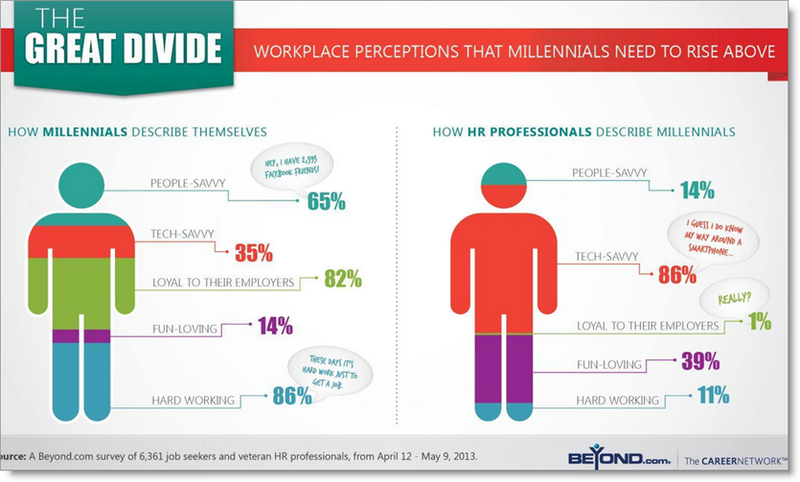 Millennials think they are good with people… but HR pros (not an authority by any means, they just happen to be in a role where they might kind of see Millennials (or have read an article about them), think that they stink with people skills. Millennials think they are okay with technology, and HR Pros assume they are excellent at technology. As an IT person, my position has been this (and the 35% from Millennials kind of agrees): “Being good at multi-tasking video games, netflix, and a smartphone, doesn’t mean you are a technologist.” I think Millennials understand, better than HR, that being tech-savvy might be more about system and database design, programming, etc. than buying the latest iphone. Millennials say they are extremely loyal to their employers (I’ll say 82% is extreme, in today’s world! ), while HR says NO WAY, no one is loyal. I’m surprised that Millennials think they are so loyal. I’m not surprised that HR doesn’t think so, because that’s what they hear at every conference, and read in every article. Another major discrepancy… Millennials think they are really hard workers. HR says that is laughable. Like, guffaw laughable. I think there are problems on both sides… but if you are a Millennial and want to break out of the brand that is not hard working and not loyal, you better work on your personal brand! I’m a baby boomer, out of work for a year. Prior to unemployment, I mainly worked with BB, Gen X and Ys. For the past year, I have volunteered and work primarily with millennials. I am impressed by how hard they work for little money, much more so than the Gen Xs and particularly the Gen Ys. Ok, they lack social skills, but overall I find them very compassionate and kind as well. @Ann, I’m GenX. I like millennials plenty fine. I feel bad that their branding, as a generation, is so rotten. Regarding working for little money, that’s an interesting point. It could be because they don’t have the same personal expenses that their older colleagues have (house, toys, family, etc.). Interestingly, working for less probably has a systematic impact on how much anyone would make.